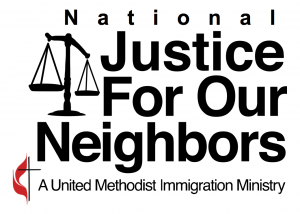 The May meeting of the Rio Texas Chapter of the Methodist Federation for Social Action (MFSA) will take place Thursday, May 14, at Saint John’s UMC, Austin. The program will focus on the Austin Region Justice for Our Neighbors (ARJFON) clinic, which is part of a national United Methodist network of legal clinics based in United Methodist churches around the country. Kevin Reed, who serves as the chair of the ARJFON board, will share the journey that the Austin program has been on since its beginning in 2012. The goal of the JFON clinics is to provide hospitality and compassion to low-income immigrants through immigration legal services, advocacy, and education. The Austin clinic is hosted on the last Saturday of each month at Servant Church, and the legal staff is housed at Parker Lane UMC in south Austin. 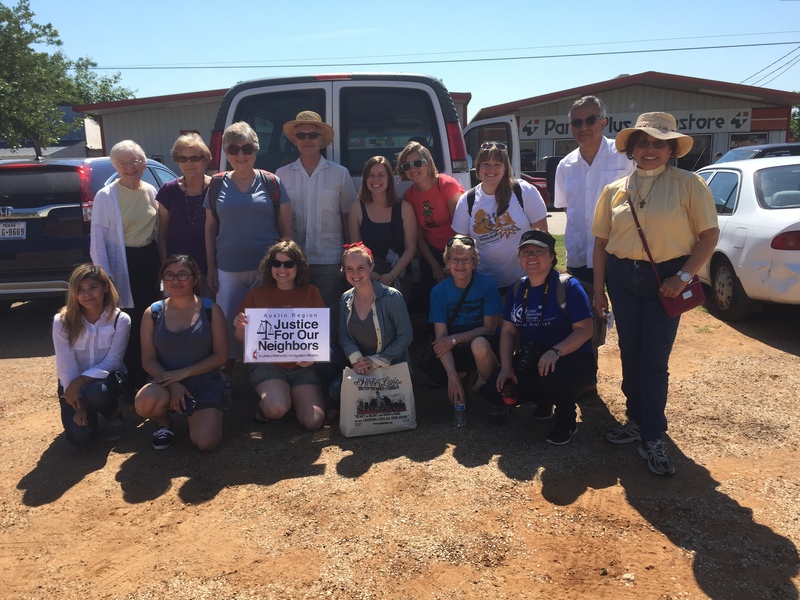 MFSA Chapter President Anne Mund and many other friends of MFSA and JFON joined in a protest on May 2 in Dilley, TX. United Methodists, faith and immigrant support groups were there to protest the shameful practice of family detention. In collaboration with a coalition of national advocacy and faith groups. The Dilley detention camp (a former “man camp” for oil workers) is now being built into the largest immigrant detention center in the U.S.
We are called to witness! If you’d like to be part of this, please let Anne Mund, our chapter president, know by email ennadnum@hotmail.com. Opportunities are available to help even if you can’t attend any of the events. All are welcome to visit with members of the Rio Texas Reconciling Team on June 12 & 13 during Annual Conference in Corpus Christi at our display tables in the American Bank Center exhibition hall. Reconciling United Methodists plan to gather for a Friday night dinner (RSVP to RioReconciling@gmail.com by June 7 if you are interested). RMN’s African Central Conferences Coordinator, Dennis Akpona, will give a testimony during the 2nd Annual Conference Reconciling Worship Service, hosted by Trinity UMC Austin in room 225 on Saturday, June 13 at 7AM. 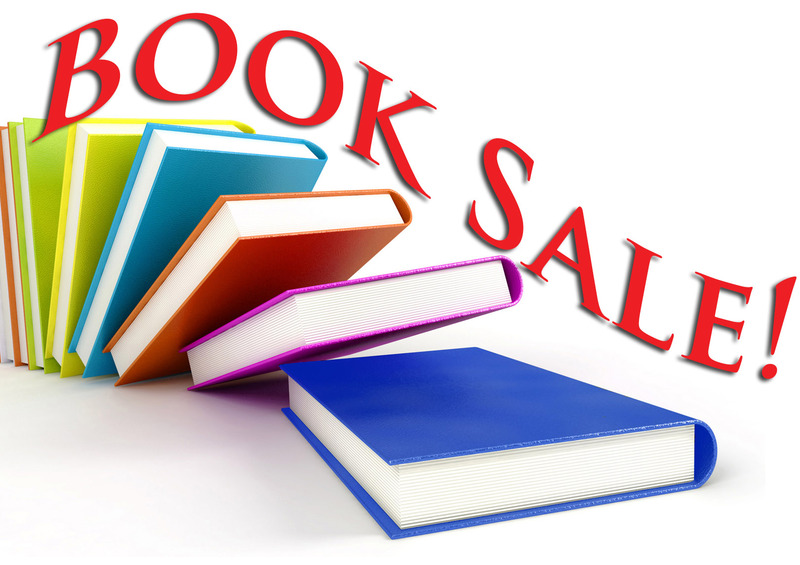 The Rio Texas Chapter of MFSA will again sponsor a Book Fair at Annual Conference in June. We ask members and friends to box up their gently used religious and spiritual books, and we haul them to Corpus Christi. It becomes like a treasure hunt at our tables! People contribute to us according to what they think the books are worth to them. It has been quite successful for the past 6 years, but to make it happen, we need your books! Contact Rowland Curry rcurry@austin.rr.com and we will arrange to pick them up. 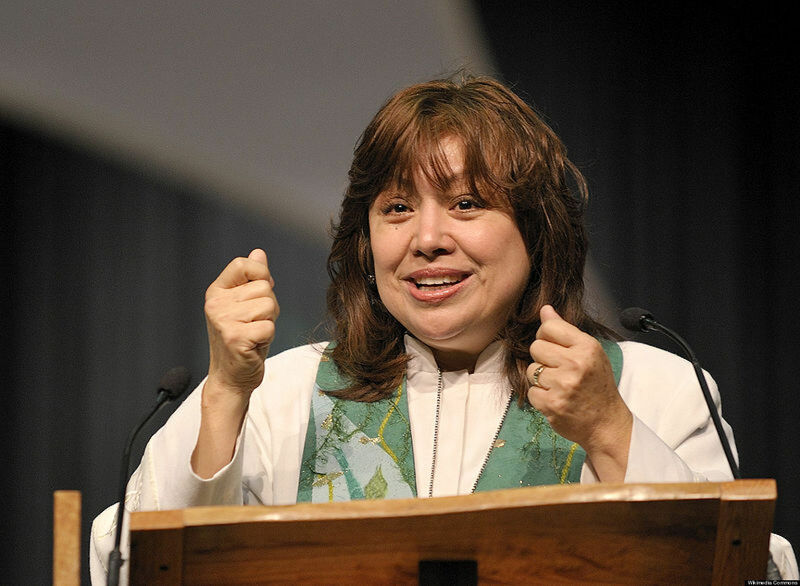 Gather at the River is a national conference that will meet at Travis Park United Methodist Church, an historic, open and justice-seeking community of faith in downtown San Antonio, steps away from the renowned River Walk entertainment and cultural district. Housing and additional meeting space will be at the Sheraton Gunter Hotel next door. Methodist Federation for Social Action and Reconciling Ministries Network members and friends in the Rio Texas Conference are preparing to provide extravagant hospitality for Gather at the River participants. Gather at the River will also include the participation of kindred groups in the Love Your Neighbor Coalition. Gather at the River is a multi-generational gathering. Program activities for children (ages 3-rising 6th grade) and youth (middle and high school) will be led by professionally-trained staff. Register Now at www.gather2015.org ! The lineup of worship leaders, preachers, speakers, and entertainment is AWESOME! If you have been to convocation or one of the joint MFSA/RMN events such as Sing a New Song in 2011, you know what a treasure it is to have this conference in our backyard!